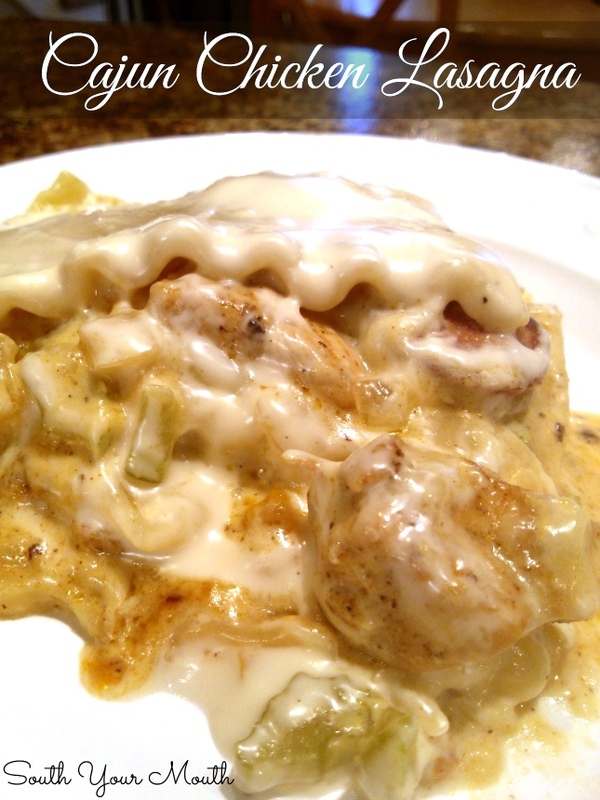 Cajun Chicken & Andouille Sausage Lasagna made with fresh peppers, onions and gobs of mozzarella cheese. Remember when David Venable put his finger to his forehead and said, “Stop it. Just stop it.” when he ate my banana pudding ice cream? Well, that’s kinda what I did when I tasted my first bite of this. My onions didn't even care about the chopped vegetables in it because, I mean, come on, it’s all swimming in alfredo sauce. They’d eat a 2x4 if I slathered it with alfredo. Speaking of, feel free to make homemade alfredo but I really didn't see the need since there were so many other flavors happening in this. Also? The leftovers were even better! Laissez les bon temps rouler, y’all! Cook andouille in a large skillet over medium-high heat until nicely browned. Andouille is already cooked through – we’re really just cooking it to render the fat and get some good color on it. Using a slotted spoon so that the pan drippings stay in the skillet, remove andouille from skillet; set aside. 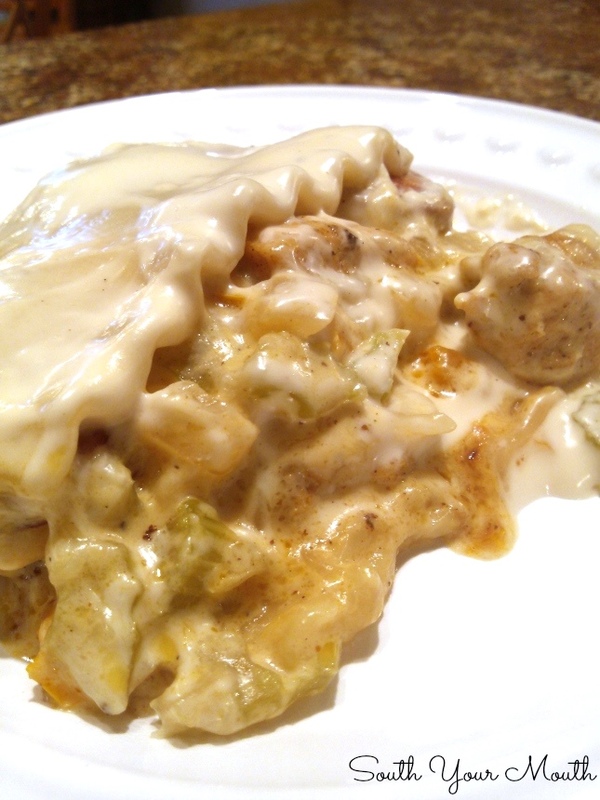 Season chicken with 1 teaspoon Cajun seasoning and add to hot skillet with pan drippings. Sauté chicken until just done, adding a little vegetable oil if necessary to prevent sticking. Remove chicken from the skillet with a slotted spoon; set aside. Add bell pepper, onion, celery, garlic and a dash or two Cajun seasoning to skillet. Sauté vegetables until tender and fragrant. Remove skillet from heat and pour in one jar of alfredo sauce. Taste for seasoning and add more Cajun seasoning if desired; set aside. Spray a 3-quart 13x9 dish with cooking spray. Arrange 3-4 lasagna noodles on bottom (whatever fits in your pan). Arrange half of andouille and half of chicken on top of noodles. Spoon half of alfredo vegetable mixture over meat. Sprinkle half of the mozzarella cheese over vegetable mixture. Repeat this step once then top with the remaining 3-4 lasagna noodles. Pour remaining jar of alfredo sauce over top layer of noodles. Cover bake at 350 degrees for 1 hour (tenting foil if necessary to prevent the foil from resting on the alfredo sauce). Remove from oven and rest, covered, for 15-20 minutes before serving. *Andouille is a cured Cajun link sausage. If you can’t find it in your area, substitute with smoked sausage or chorizo. I sliced mine into bite-sized pieces but in hindsight, I think it might have been even better and would have added more texture if I’d diced the sausage. **The combination of bell pepper, onion and celery is called the Holy Trinity in Cajun cooking and really is what gives this dish the Cajun flavor (more so even than the Cajun seasoning). I used an orange bell pepper in mine because it’s what I had but authentic Holy Trinity has green bell peppers. This sounds amazing! I'm concerned that there's no sauce in the the layers except that on the veggies - is it moist enough? And none on the bottom of the pan? Ohhh yeahhh, it's plenty moist. So much so that I suggest a loaf of crusty bread at the ready to sop all the sauce up! Made this last night and to conserve time and energy I prepared it as written then mixed it all together, except lasagna noodles and cheese, and served it over thin spaghetti pasta and sprinkled with cheese. Everyone loved it. 1 person even had theirs over rice. Thanks for sharing. I will make it as lasagna next time, Very versatile and yummy recipe. Made this two days ago, and it was wonderful. I will be making this again very soon! This was a huge hit tonight! Swapped the chicken for leftover shredded beef and added in some zucchini so I didn't have to make a veggie. This will go into the continue to make pile. Could this be made in a crockpot? Any tips?